This will be a multi-part answer, to accommodate a series of images. Yes, all the castings appear to be legitimate and historic, not modern replicas. The seat end castings are of the Buntin design, covered by a design patent in 1867, and reissued in 1873. 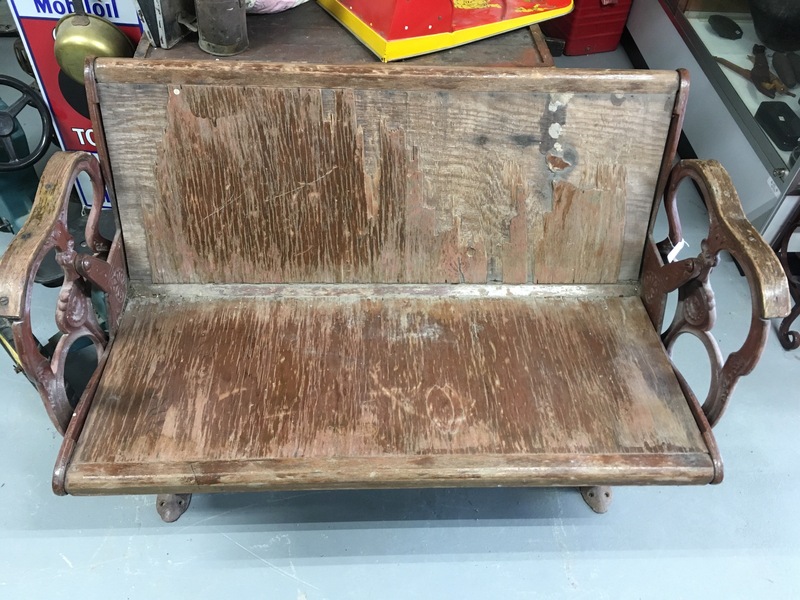 The original wooden seat (not the present seat), plus related castings, are for the Gardner perforated wooden veneer seat, also covered by a series of patents between 1872 and 1876, with the specific railroad seat version covered by an 1876 patent. First the Buntin seat end castings. The Buntin seat design normally has a full-size casting at the isle end of the seat (at the front in the photo supplied) and a half size casting on the wall end of the seat. There are a number of Buntin seat ends with a variety of relatively minor detail differences, all covered by the design patent issued in 1867, and reissued in 1873, per attached. The present seat end casting appears consistent with other Buntin seat end castings associated with Gardner veneer seats. The present seat in the photo also appears to use two fill size isle-style seat end castings in order to make a free-standing seat. There are replica Buntin seat end casting sets available, but these seat end castings do not appear to match the details of the replica Buntin seat end castings. I know of no replica castings that are for the distinctive parts of the Gardner veneer seat version of the Buntin seats. Next the Gardner veneer seat, specifically the version of the Gardner veneer seat that uses a single veneer seat formed for both the seat and the back, and is reversible for direction the seat faces. There are versions of Gardner veneer seats that have separate veneer pieces for the seat and the back. The Gardner Company produced numerous seats and chairs intended for use outside of a railroad car - the railroad car seat portion was only a small part of their overall line of seats and chairs. The patent for the present Gardner reversible seat is from 1876, attached. The original Gardner veneer seat is covered by a pair of patents from 1872, both of which received reissued patents extending their patent period. The single piece (seat and back combined) veneer was patented in 1873. 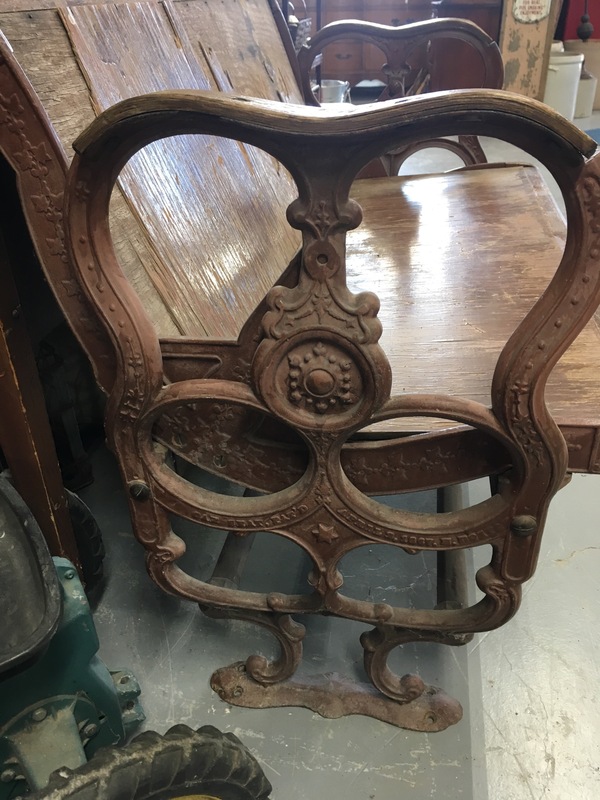 The following 2 comments will have photos of a surviving example of a Gardner veneer seat of single seat size, with Buntin ends, at the private Double T Agricultural Museum owned by Tony Azevedo. Here is a set of photos of a Gardner veneer seat with Buntin ends from Tony Azevedo's private Double T Agricultural Museum taken in 2014 when it was in storage. Note this seat has a shaped wooden piece supporting the Buntin wall end castings (instead of using a second isle end casting as in the present seat example). 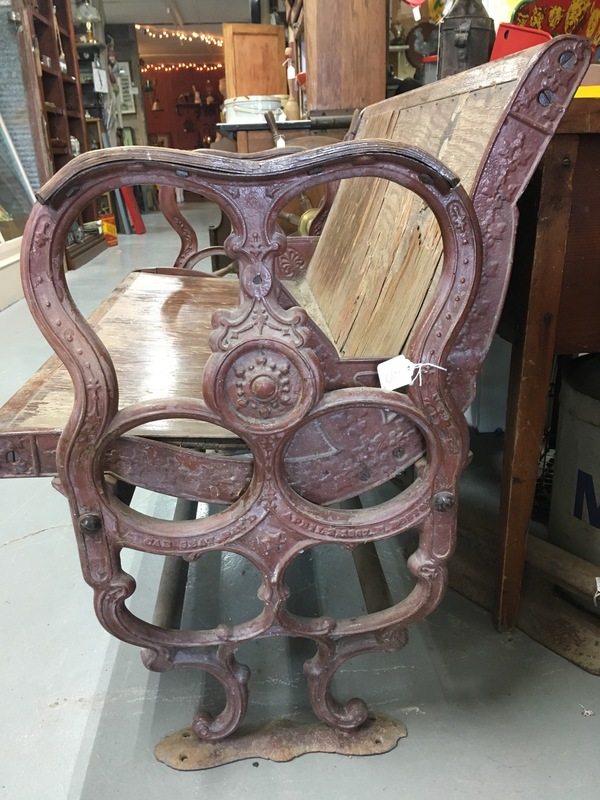 Here is a set of photos of a Gardner veneer seat with Buntin ends from Tony Azevedo's private Double T Agricultural Museum taken in 2018 after it was placed on display.